First off, I’m going to admit right now that blogging is hard work. I envy those who can type out a fabulous, thought-provoking blog post every day, or even every week. I seem to write numerous posts in my head, but they never actually make it into the computer. I think I am somewhat paralyzed by my enemy… perfectionism. I think it needs to be “perfect” to be read. I have decided this simply isn’t true. I put my best foot forward on my recent book release. However, from now on, I am not going to try to make every blog posting perfect. Here goes. I have always been a runner. At first I was a gymnast. In middle and high school, I gravitated toward the sprints, probably due to my gymnastics background. In high school I even made it to state in hurdles one year. In college and early marriage, I would run 20 minutes once or twice a week. In 1997, I began running Race for the Cure every year. I was satisfied with running no more than a 5K. Three years ago, my husband and I decided to sign up for (Portland’s) Shamrock Run. We had to decide between the 5k and an 8K. We asked ourselves, “Can we even run an 8K? How far is that?” I looked it up and found out it is 4.97 miles. We agreed to try it. We figured, if we had to walk after we hit the 5K mark, oh well. Race day came, and we ran the whole race, feeling exhilarated at the end. We were hooked! I then began signing up for races of progressively longer distances. Flash forward to this year. I decided with two half marathons and two Hood To Coast races under my belt, it was time to commit to the full marathon. I planned it right after my 40th birthday so I would have an extra 5 minutes to qualify for the Boston Marathon (the dream of many runners). I began building my base mileage in late fall, and started true marathon preparations in January of this year. During training, I experienced all types of issues… sore muscles, foot injuries, terrible weather, missed workouts, and yes, DIARRHEA. (You knew I was getting to that, right?). I experimented with different run strategies to combat the dreaded runner’s trots. Some worked, some didn’t. Once I used the porta-potty in front of a house under renovation because otherwise I was going to have an accident. More than once I got only a mile from home, only to have to turn around and run home for one more bathroom stop. During training, I discovered two things that works for me: taking two Imodium before I run, and drinking a rehydration solution. A packet of World Health Organization (WHO) rehydration salts, mixed with Crystal Light for flavoring and enough water to make one liter of rehydration solution. The WHO solution was created to treat diarrhea (particularly cholera) in third world countries, where severe diarrhea can quickly lead to dehydration and death. I have discovered it works great for my runner’s diarrhea. 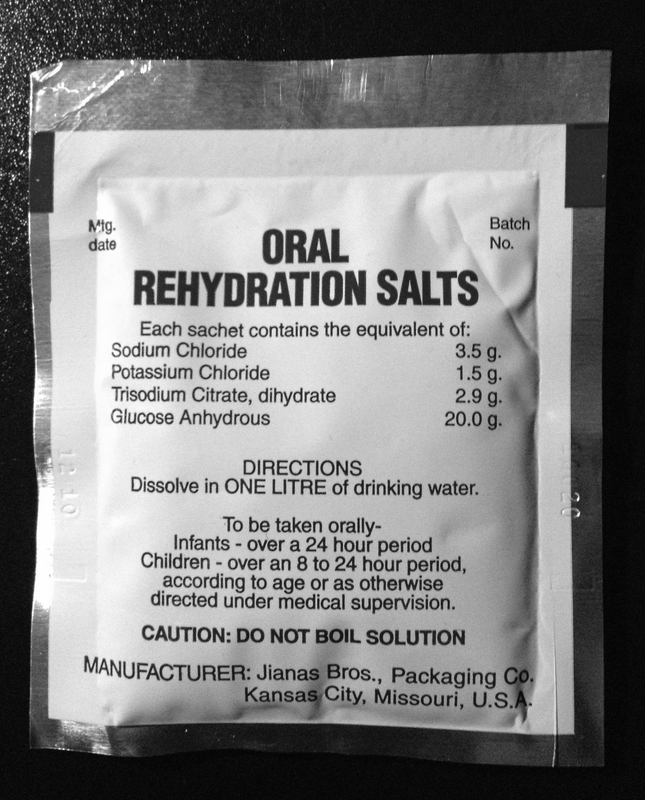 The sodium and potassium profile is much higher than Gatorade or similar. The higher the sodium intake, the more fluid the body must keep in to balance it out. 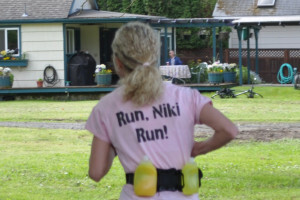 When I drink this solution before I run, the extra sodium keeps fluids inside my body, so I don’t need to pee very often. My own observation (not based on research…) it seems to slow down diarrhea too. Bonus!! I also carry it on my water belt during long training runs. The week prior to the race, I was very careful with what I ate. It probably sounds strange to hear a dietitian say this, but I actually ate very few fruits and veggies the entire week. Lots of simple carbs (breads,cereals, crackers, rice, pasta) and protein (dairy, chicken and pork). Beginning on Thursday before the Sunday race, I carried a water bottle around with me constantly, making sure I was very well hydrated (urine very light yellow). The day before the race, I ate cereal for breakfast, a sandwich for lunch, and for dinner, my best friend made homemade spaghetti with french bread (I think I ate 6 slices). Before I went to bed, I took a dose of Imodium and chugged more water. After a night of tossing and turning, I got up at 4:50am and took another dose of Imodium. On the shuttle to the race start, I ate some dry cereal, most of a yogurt, and half a banana. As soon as I arrived, I got in line for the porta potty. (No diarrhea, yay!) I had about 45 minutes until race time, and I spent the time sipping about 8oz. my favorite hydration concoction. It was cloudy, and temps were in the 50’s. Perfect race conditions! Finally, the race was underway. The first few miles went by uneventfully. I took my Honey Stinger gel after 50 minutes (I have found this to be the most gut-friendly energy gel, but some people do better with real food), and alternated sipping rehydration solution and water. At mile 8, realized my legs already felt heavy, and I was less than 1/3 into the race. I occupied myself by trying to keep up with the 3:45 pace runner (who was carrying balloons, so I could see him blocks away.) At one point, I caught up to him. He was talking about how he was testing out the race course the day before and saw two people playing guitars… completely naked. “Only in Eugene” we told him. Someone asked him about his marathon history. 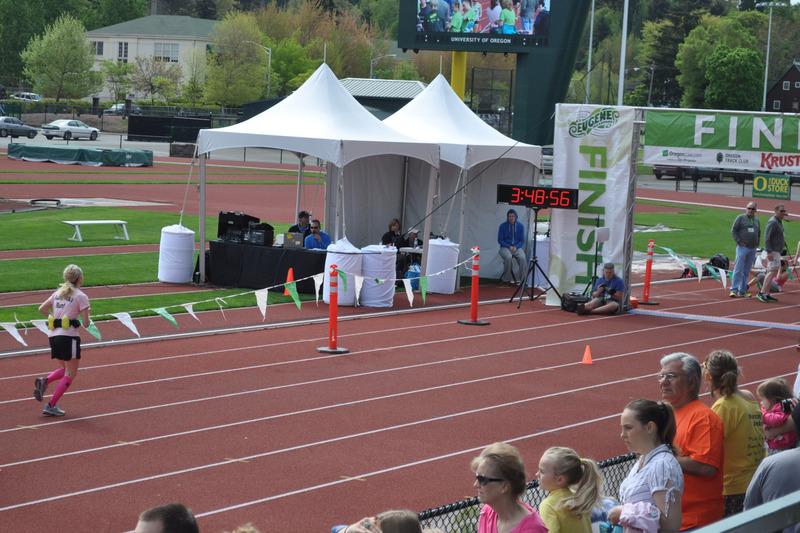 We found out he had already run 42 marathons and his PR was 2:42. Wow, humbling and motivating at the same time. At mile 13, I saw my family, parents, and best friend and her family. (I forced myself not to get too emotional after seeing so many of my loved ones there to support me.) Seeing them gave me extra energy, and they traded my empty hydration bottles for full ones. I was so distracted at this time, I accidentally let the pace runner slip about 2 blocks ahead. As the miles ticked by, it really lifted my spirits when people read my shirt and yelled, “RUN, NIKI, RUN!” Thankfully, my gut was quiet and my bladder remained empty. At mile 19, my oldest son, age 11, joined me on the course for my toughest 4 miles. He enjoyed picking up the unused energy gel packets that runners had inadvertently dropped. We could see the pace runner, but he was quite a ways ahead now. 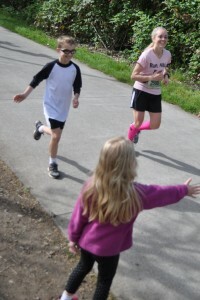 My son paced and encouraged me before meeting up with the family again at mile 23. The last three miles were difficult. The runners around me were slowing down, and I knew I needed to speed up to meet my time goal. I looked at my watch, and knew I would have to run a very fast 5K to meet my time goal. About this time, I started feeling nauseous, but forced myself to take one more gel and sip water for energy to finish strong.I ran by a fallen runner surrounded by paramedics, feeling sad that he would not get to finish the race. 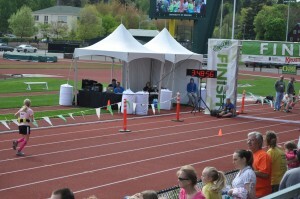 Finally, I ran into the University of Oregon stadium onto the track, hearing more shouts of “GO NIKI! !” from other friends. Well, I have to be honest. This post has taken me 3+ weeks to finish. So much for “letting go” and trying to be a fast, consistent blogger. I’m still a “work in progress!” Thanks for reading my marathon recap.